Back in June 2017, I started a business creating and selling meal plans for bodybuilders. To my surprise, the first sale came just days after launch, followed by five more within a few weeks. But there was a problem: it was losing money. And I didn’t have the luxury of burning someone else’s cash, this was entirely self-funded. To be precise, sales in the initial period amounted to $146.09 (five sales at $27, one at $12) and total expenses amounted to—$363.34. That’s a net profit of -$217.25 (WTF!). This didn’t tell me why it was losing money, however, or if I should carry on. So, I decided to find out. Here are the steps I took to lift the hood on my early-stage venture and make that critical decision. First, I looked at total revenue minus total expenses. This gave me the high-level view and was equal to -$217.25, as mentioned earlier. A sales funnel shows the steps a customer goes through when purchasing products (much like a customer journey map). By drawing this, I’d be able to see where money was being spent and where it was being generated, as well as major problems and opportunities throughout. The basic sales funnel I created. For more information on sales funnels, I recommend Neil Patel’s free conversion funnel guide. Next, I assigned financial values to each step in the sales funnel based on where costs were incurred, and revenue generated. I also calculated conversion rates from each step of the journey to the next. Where money was made and spent along the sales funnel. *Variable costs included the ad spend (-$222.52) and Stripe payment processing fees (-$3.76). Overheads for the same period amounted to -$147.06, which were primarily subscriptions costs for the landing page builder and meal planning software. First, the cost per click (CPC) using Google AdWords stood at -$0.44, which was better than average for the fitness industry. The cost to acquire all six customers (-$222.52), however, was higher than the total revenue generated ($146.10). On average, it cost -$37.09 to acquire a new customer—that was 56 percent higher than the average margin made on each product ($23.72). Saying that, it’s normal for a business to run with a customer acquisition cost that is higher than the initial sale, knowing that they’ll spend more money down the line—often called a loss leader. Looking at the visual representation of my sales funnel, however, I could see that none of the customers bought again. No one even visited the secondary sales page. That meant the average value of a customer was also negative (-$13.37), albeit judged over a very short timeframe. Even with a healthy margin and low operating costs, the venture couldn’t be profitable when the value of a new customer was negative! On a positive note, some of the conversion rates looked quite healthy. Combining the pre-sale steps, however, only 1.18 percent of people who clicked the advert ended up buying. Whilst that wasn’t horrendous for what was essentially a cold pitch, it had room for improvement. While the analysis showed fundamental flaws in the business model, it also highlighted several opportunities to increase profitability, along with a useful spreadsheet I could use to crunch the numbers. A financial dashboard can also be helpful if you’re less interested in learning Excel. On the one hand, I could try to increase the value of a new customer, starting with increasing the price of each meal plan. Revenue projections if each meal plan sold at a higher price of $39.00. But closer to $64.00 to break even overall. Revenue projections if each meal plan sold at a higher price of $64.00. Or, I could introduce an upsell or cross-sell, such as offering multiple meal plans and/or complementary products at a discounted price during checkout. Selling bundles of two meal plans at just $19.10 each would recoup marketing costs, and bundles of three at around $21.10 each would break even overall. An example of an upsell from Harry’s. Alternatively, I could try to increase the repeat purchase rate, by implementing a post-purchase email sequence for example. All else being the same, more than 50 percent of customers would have to buy again just to break even on ad spend, however. Revenue projections if repeat purchase rate was above 50 percent. On the other hand, I could try to reduce the cost to acquire a customer. With a relatively low cost per ad click, it seemed logical to focus on increasing the conversion rate from ad click to purchase. Increasing this by just 0.8 percentage points to around 2 percent would mean the value of every new customer would become positive. Revenue projections if conversion rate from ad click to purchase was 1.97 percent. And by increasing this to just over 3 percent, the venture would break even overall. Revenue projections if conversion rate from ad click to purchase was 3.1 percent. Adding an exit intent pop-up on product pages can apparently boost conversion rates by 5 to 10 percent, and single-page checkout pages have been shown to outperform multi-page checkouts (like mine) by up to 20 percent. Then there’s the option of paying a pro to optimize the pages and copy for conversion, but that’s an additional cost. 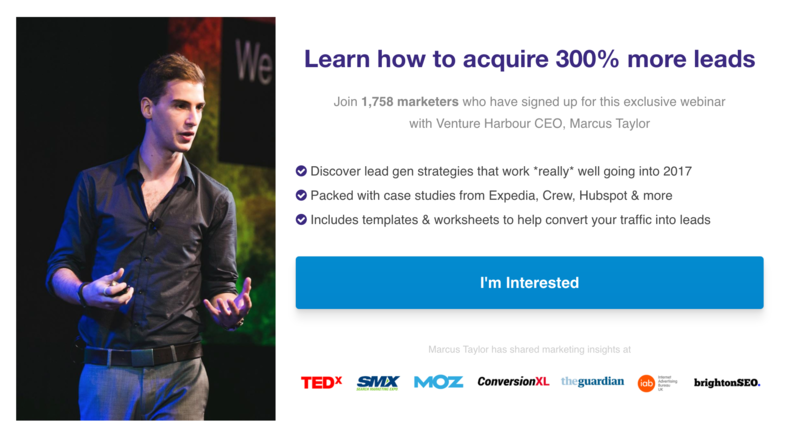 An example of an exit intent pop-up from Venture Harbour. Instead of going in with the hard sell, I could try to show value upfront (for free) and then pitch the sale—much like companies like Netflix and Spotify do by offering a free trial. This could look something like an advert that leads to a simple opt-in page, which offers something in return for your email address. Once you sign up, you’ll receive a series of welcome emails, including the freebie you signed-up for. Over the course of the next few days, you become accustomed to the brand so when the offer is presented, you’re more likely to buy (in theory). A landing page I’ve used to achieve >25 percent opt-in rate. If I could achieve an initial opt-in rate of around 25 percent, as I have done in the past, I’d get 127 email subscribers for the same ad spend. Then, if just 30 percent of the subscribers visited the sales page, which also converted at 25 percent (up from 12.77 percent), I’d get an additional four sales for the same ad spend—and a customer acquisition cost of -$22.25, saving $14.84 from before. Revenue projections with a welcome email series. Which option(s) did I choose? Rightly or wrongly, I decided to go with my instinct and get out. The findings didn’t make for pretty reading and there was a load of stuff I’d not yet factored in, such as the additional costs that’d come with scaling. Being honest, I was probably intimidated by the amount of work I thought had to be done too, and my ability to do it. So, while I might not have had a profitable business this time, I did at least create a valuable framework I can apply to any future business venture or consulting project, and that you can too. Have a go at mapping your sales funnel, crunch the numbers and see what you learn. It might just surprise you.